There is no teaching of the Buddha more profound than that of wisdom, the ultimate view of reality, which like a diamond cuts through our wrong conceptions and brings liberation. And this is clearly expressed by the Buddha's himself in the Diamond Cutter Sutra. We are delighted to announce that our precious Spiritual Director, Lama Zopa Rinpoche has kindly offered to give the oral transmission for this profound sutra, which contains the essence of the teachings on the bodhisattva path to enlightenment. 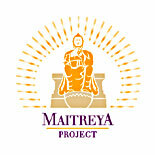 The recitation will particularly be dedicated to remove obstacles to the success of the Maitreya Project - the construction of a huge 500-foot statue of the future Buddha, embodying loving-kindness, in the holy place where the Buddha achieved enlightenment, Bodh Gaya. Since Tuesday 24 July is also one of the four special anniversaries of the Buddha -- specifically the day which commemorates the first teaching given by the Buddha, called the First Turning of the Wheel of Dharma -- the effects of virtuous and non-virtuous actions are said to multiply 100 million times. 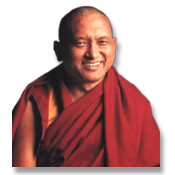 To download an MP3 file directly to your hard disk, right click on a link below and use the command "Save Target As..." or "Save Link As..."
Lama Thubten Zopa Rinpoche Rinpoche was born in Thami, Nepal, in 1946. At the age of three he was recognized as the reincarnation of the Lawudo Lama, who had lived nearby at Lawudo, within sight of Rinpoche’s Thami home. At the age of ten, Rinpoche went to Tibet and studied and meditated at Domo Geshe Rinpoche’s monastery near Pagri, until the Chinese occupation of Tibet in 1959 forced him to forsake Tibet for the safety of Bhutan. Rinpoche then went to the Tibetan refugee camp at Buxa Duar, West Bengal, India, where he met Lama Yeshe, who became his closest teacher. The Lamas went to Nepal in 1967, and over the next few years built Kopan and Lawudo Monasteries. In 1971 Lama Zopa Rinpoche gave the first of his famous annual lam-rim retreat courses, which continue at Kopan to this day. In 1974, with Lama Yeshe, Rinpoche began traveling the world to teach and establish centers of Dharma. When Lama Yeshe passed away in 1984, Rinpoche took over as spiritual head of the FPMT, which has continued to flourish under his peerless leadership.